Marlton resident Marc Bertino knew he was competing with a very good adult tennis team when he took the court with a United States Tennis Association League team from Washington Crossing, Pa., this year. However, he never thought the team would be one of the best in the United States. Washington Crossing did much better than just win its local district. The team qualified for the USTA League National Championships on Oct. 30 and advanced all the way to the championship match before losing to Dallas, Texas. The team included a number of players from South and Central Jersey including Bertino, Haddonfield resident Jeoffrey Purnell, Cherry Hill resident Alex Lawrason and Princeton resident Joseph Hargrove. 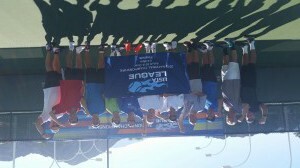 The team consisted of about two dozen experienced tennis players from Pennsylvania and New Jersey. Washington Crossing competed in the USTA 40 and older 4.0 adult league. During the regular season, the team competed against other teams from around the Philadelphia area. The team then competed in district and regional tournaments, winning both to advance to the national championships at Indian Wells, Calif. Washington Crossing was one of 16 teams to advance to nationals. There were about 1,500 teams nationwide who played in the division this year. “To know that you’re one of only 16 teams to make it out there, that’s a big accomplishment,” Hargrove said. With the team consisting of some of the better adult tennis players from around the area, Bertino felt the team was going to be competitive. When the season started, however, he didn’t think they’d get all the way to the national level. Purnell said all of the team members were avid tennis players who practiced anywhere from four to seven days per week. He felt this was a key to their success. “We’re all playing four to seven days a week, so we all kind of trained on our own,” Purnell said. Prior to going to nationals, the team practiced together in Delaware for two days. Lawrason, who has played for multiple teams in USTA league in the past, said the trip was huge in building camaraderie among the team members. Hargrove had been to nationals with another team in 2013. He said the key for a team to make it to nationals is to have strong team unity. At nationals, Washington Crossing continued its winning ways. The team went a perfect 3–0 through the round robin portion of the event on Oct. 30 and 31 and advanced to the semifinals on Nov. 1. In the semifinals, Washington Crossing defeated Centennial, Colo., 4–1, to advance to the national championship match against Dallas. The team fell just one victory short of being national champions, losing to Dallas, 3–1. Hargrove said the team was disappointed after losing the championship, but the loss didn’t take away from what the team had accomplished. There were individual success stories among the team’s success. Bertino and Purnell played doubles together throughout the season and were unstoppable. The pairing went a perfect 14–0 in tournament matches, including a perfect 5–0 at nationals. They earned the team’s lone win against Dallas. Lawrason said the entire experience, from the matches to the activities off the court, was special. He was especially pleased with the good sportsmanship and camaraderie the teams shared with one another. “Everybody exhibited really good sportsmanship and were respectful of everyone else,” Lawrason said. USTA League rules don’t allow teams who advance to nationals to compete together again in subsequent seasons, so Washington Crossing’s team will have a different look next year. However, all team members say they will continue to play tennis and dream of making a return trip to Indian Wells in the future. “I’m looking forward to doing it again next year,” Purnell said. “Hopefully, you can catch lightning in a bottle and get back there again,” Lawrason said.